Now that we have some of the basic types and pattern matching under our belts, I thought it high time that we learnt a bit about how to organize our own code. Throughout some of the posts we have already been through I have been referring to modules such as the “List module”. In this post we will see not only how to create our own modules but also why they are important. We shall also see how to organize files/type definitions, and see why this is important. Happy days, no more issues. That is however a very short term, and not very long sighted win. Surely there must be a better for us to organize our code in F#. Well yes there is. Help comes in the form of files and modules. Now you may be wondering why you would need to move files up and down. Well it is for the same reason the type definitions did not work earlier, the files have to be in a certain order too. 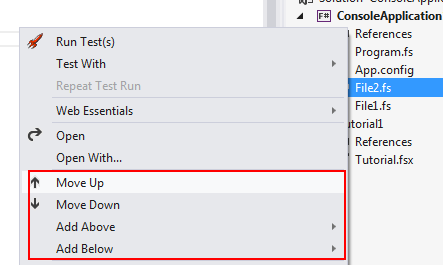 That is to say if you have a function declared in File2.fs that is needed by File1.fs, File2.fs MUST appear before File1.fs in the visual studio IDE. These things (like them or not)are done to encourage you to organize your F# files in a correct way. 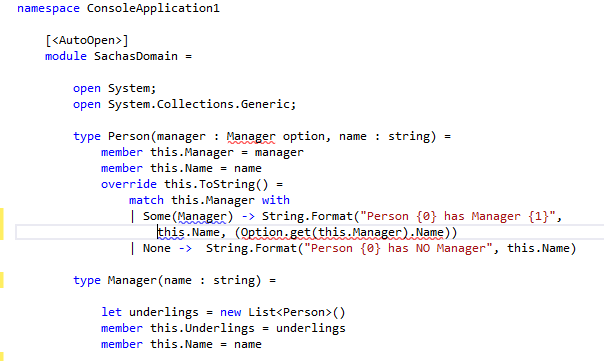 Modules in F# are a way to logically group functions/types and let bindings. According to MSDN it is implemented as a common language runtime (CLR) class that has only static members. A module can contain many types, and functions. It can even contain sibling / nested modules. Though it should be noted that as soon as your F# project grows beyond one file you will need to also include namespaces, but more on this later. Namespaces allow you to organize your code into related functionality by enabling you to add a name to a grouping of elements. if you decide to use namespaces they must be the first element of a file, and everything else in the file will become part of the namespace. So if you find you want to use more than types then you will need to start to look at namespaces that contain modules. As I have also stated, once you go past that magical limit of 1*.fs files, you will need to worry about namespaces too. Though this sounds like a PITA it really isn’t that bad, all you need to do is add a namespace declaration and make sure to fully qualify your module imports with the namespace name where you need to import the module. Here is an example of a couple of namespaced modules in a multi *.fs file project (this is the actual order they appear in within the project as well). As you can see File1.js /File2.js simply contain function definitions, whilst File3.js makes use of the File1.js and File2.js functions, which it does by opening the modules, where the module name is fully qualified. The last file in the project Program.fs makes use of the File3.js functions, which as before it does by opening the module. There is a special attribute that can help you with modules, which is the AutoOpenAttribute, which can be applied to modules, which makes the contents of the module available to other modules in the same namespace. The Person type is not compiling as it has a dependency on the Manager type, which is doesn’t know about due to the position of the Manager type in the F# code file. Ok we could move the Manager type up, but then it would start complaining as it has a dependency on the Person type. Right now the Manager type is ok, as Person is declared above it, so it knows about the Person type.